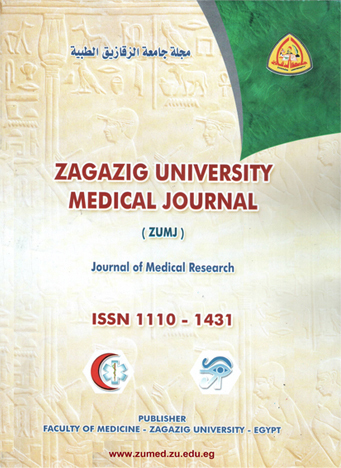 1The Department of Clinical Oncology and Nuclear Medicine, Zagazig University, Egypt. Purpose: To evaluate efficacy and safety of hypofractionated radiotherapy concurrently with temozolamide in treatment of high grade gliomas. Method: 54 patients with GBM enrolled and divided in two groups, the group A consists of 27 patients treated prospectively by three dimentional (3D) conformal radiotherapy at a dose of 40Gy / 15 fraction over 3 weeks and compared with the other group B which consists of 27 patients treated retrospectively at a dose of 60Gy / 30 fraction over 6 weeks, both groups received temozolamide concurrently with radiotherapy. Results: Over all response was 59.3% in A group and 55.6% in B group without significant statistical difference in both groups. The median follow up in both groups was 11 months. 6th month PFS in group A was 58.6% and in group B 52.7% without statistical significant difference. 6th month OS in group A was 81.5% and in group B 85.2% without statistical significant difference. On univariate analysis of the prognostic factors of progression the extent of surgery, histological subtype and response to radiotherapy are significant predictors. There is no significant statistical difference in toxicity of treatment between both groups. Conclusion: HRT concurrently with temozolamide may be used as an option in treatment of high grade glioma.